The latest embarrassing rebuff for Mrs May has thrown her Brexit vision into further disarray as support from her own Cabinet begins to dwindle. 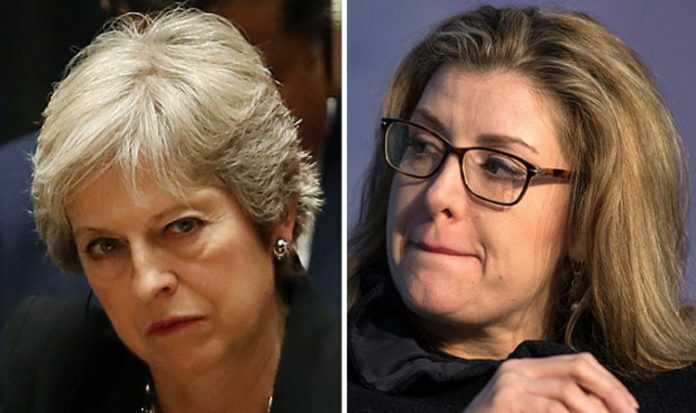 According to the Sun, Ms Mordaunt insisted she still “supports” the Prime Minister but stopped short at endorsing Mrs May’s controversial Brexit blueprint hammered out at Chequers. The Secretary of State for International Development’s stance heaps pressure on the Prime Minister after Brexit Secretary Dominic Raab and Foreign Secretary Jeremy Hunt revealed they were open to a looser Canada-style trade deal with the EU. In another blistering blow to the Prime Minister, three of her most senior Cabinet Ministers have joined forces with a faction of Brexiteer dissidents plotting to coerce her to ditch her notorious proposals in favour of a so-called Canada-style agreement, The Spectator reported. The magazine claimed the Tory rebels would bide their time until after the party conference, which kicks off on Sunday. EU bosses also rubbished Chequers in Salzburg last week as Mrs May struggled in vain to convince the bloc her plan is still a viable option. Former Home Secretary Amber Rudd poured fuel on the fire last night when she claimed Remainer Conservative MPs would vote down any Canada-style deal. In a further knock to Chequers, Environment Secretary Michael Gove has suggested MPs could undo the Chequers deal once the UK is out of the EU. Speaking on The Andrew Marr Show, he said the Prime Minister’s proposal was the “right one for now”. Mr Gove’s intervention came hours before former Foreign Secretary Boris Johnson issued yet another biting appraisal of the plan. Writing in the Daily Telegraph, he said Chequers would “amount to a change in Northern Ireland’s constitutional status without its people’s consent”. Mr Johnson’s latest diatribe against Mrs May’s Chequers plan came in a newspaper column published last Sunday. Writing in the Sunday Telegraph, Mr Johnson said: If we go with the Chequers approach, the public will spot it. “They will see that the UK has become a vassal state, that we have not taken back control, but lost control.